Lewisham ’77: A Fantastic Resource! I while ago I discovered the Lewisham ’77 Blog. It is a fantasic resource for students and to those interested in anti-fascism. The blog contains numerous pictures, stories and details. I’ve spotted this short article on Spurs Against the Nazis in the 1970s on the Spurs Anti-Fascists facebook page. Spurs Against the Nazis by Richard Buckwell. This post will list materials relating to Brighton Anti-Fascist Action. I have received a series of fairly heated letters between Tony Greenstein of Brighton AFA and Gerry Gable of Searchlight. They reveal tense relations between t he two. 13/07/93 – Searchlight’s Gerry Gable replies to Brighton AFA’s letter. It’s heated from the beginning and deals with the allegations. 16/07/93 – Tony Greenstein replies back to Searchlight. He deals with the allegations of taking copies of Searchlight without paying. He goes on to discuss the Class War inquiry, Lara O’Hara, and another 6 points. Leeds AFA (1993) memo on the World in Action claims that they had infiltrated an AFA meeting. “Though people are probably aware that the WIA ‘expose’ was set up by Searchlight, Searchlight also warned AFA against having any involvement in the expose! It is also worth noting that the letter from Leeds AFA attacking the makers and by extension Searchlight is signed by ‘Paul’. In the 1997 AFA inquiry into Leeds AFA as whole, ‘Paul’ admitted to being a Searchlight asset…” Joe Rielly. Rituals of Remembrance and Protest. It’s 11.00 on the 11th November as I start writing this. The campus has just slipped into observing a two-minute silence to mark Armistice Day and I’ve slipped into the silent rage that these celebrations of imperialist slaughter always provoke in me. To shift my mood a little, I remember instead two rituals of remembrance that I associate with the Non-Stop Picket of the South African Embassy back in the 1980s. Remembrance Sunday was always a tense day on the Non-Stop Picket. Situated in Trafalgar Square it was less than a mile away from the Cenotaph on Whitehall, the focus for state rituals of remembrance. Sometimes the hordes of passing former servicemen and women passing the Picket on their way to or from the ceremony at the Cenotaph could be antagonistic towards the anti-apartheid cause (although that was not universally the case). Those retired soldiers were never the real problem, though. The threat posed to the Non-Stop Picket on Remembrance Sunday was the annual parade passed the Cenotaph later in the day by the motley membership of the neo-fascist National Front and/or British National Party. 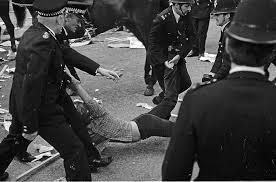 They definitely didn’t like anti-racists protesting against apartheid, and had a tendency to either try to launch full on assaults against the Picket or, more ‘subtly’, attempt to provoke violent arguments with picketers. In response, each year on Remembrance Sunday large numbers of City Group supporters and other anti-fascists would mobilise and gather on the Non-Stop Picket to defend it against potential attack. On 13th November 1988 in particular, hundreds gathered outside the Embassy in response to heightened fear of fascist attack. In parallel to these mobilizations, activists from the Non-Stop Picket would often patrol the area with Anti-Fascist Action to spot and head off groups of fascists heading towards the Picket. These anti-fascist mobilizations to defend the safety and integrity of the Non-Stop Picket once again highlight the ways in which, for the members of the City of London Anti-Apartheid Group, the politics of anti-apartheid solidarity activism could never be separated from anti-racist and anti-fascist work in Britain. There is one further way in which I want to remember rituals of remembrance associated with the Non-Stop Picket. That is to consider the ritual practices that City Group developed to remember those freedom fighters killed by the apartheid regime. When apartheid prisoners were executed, anti-apartheid activists were assassinated by South African agents, or the South African Defence Force (sic) massacred youth in the townships, City Group would respond to witness that act of state violence. 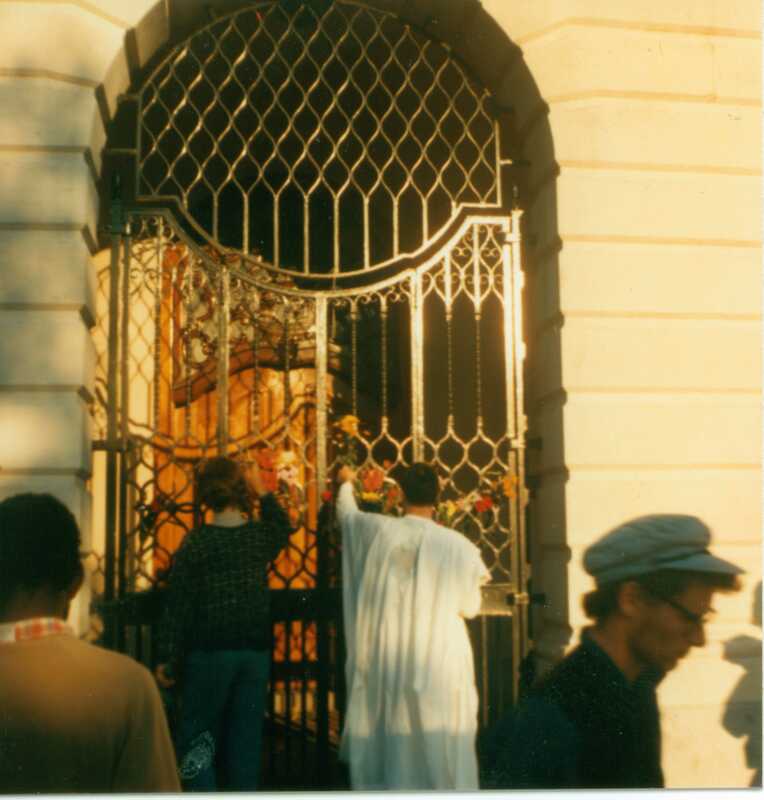 Very often this involved a ritual of placing flowers on the imposing, monumental gates of South Africa House. Sometimes this would be a modest and spontaneous act by the protestors gathered on the Picket for a particular shift, but during the weekly Friday night rallies or other large gatherings, a dignified queue would form as scores of protestors waited to add their flowers to the Embassy gates until they were bedecked in flowers of remembrance. More often than not, the picketers would sustain the haunting melody of Senzenina, a song sung at political funerals in South Africa, throughout this act of witness, mourning and remembrance. If poppy-wearing and the official two-minute silences of Armistice Day and Remembrance Sunday serve as nationalistic rituals that reproduce public support for continued military intervention around the world through the remembrance the fallen soldiers of past wars; then, the laying of flowers on the gates of the South African Embassy and the singing of Senzenina renewed the commitment of the picketers to stand in solidarity with those resisting apartheid in southern Africa. This article is from the fantastic Non-Stop Against Apartheid blog. This post will feature anti-fascist leaflets. It will be updated repeated, so check the weekly updates for changes to it! Thanks to SM for 1-9!!! Thanks to ST for 10! Thanks to J for 11-15! !